Ivan Cruz is a Fuenlabrada fan, and is @CampoAtras on Twitter - give him a follow! I consider myself a familiar person and lover of football (I play in the Liga municipal de fútbol 7 for Alcalá de Henares), and also of basketball. My favorite teams in these 2 sports are C.F Fuenlabrada and Montakit Fuenlabrada. How long have you been a fan of Fuenlabrada and what made you support them in the first place? I have been a fan of C.F Fuenlabrada for 20 years. Why? When I was 15, on the radio, they gave tickets to those under 18 years old to see C.F Fuenlabrada. Coupled with my unhealthy fondness for football, it led me to have great feelings and a great liking for this team. Describe your first experience of watching Fuenlabrada play? As I said before, my fan-hood began with those free tickets that they gave us under-18s on the local radio, and one day my friends and I, we decided to watch the team of our municipality for the first time. The truth is, we liked the atmosphere from the very first day. We used to attend, about 500 people and every 14 days, the matches at the Aldehuela. The fans were very familiar, CF Fuenlabrada players were very close to the fans, and since then my heart is as blue as the color of the shirts of this team, and above any first division club, CF Fuenlabrada is my first team, where I smile with victories and suffer with defeats. 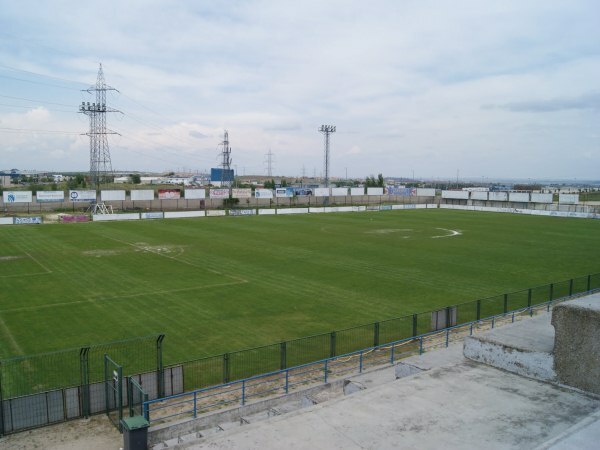 To an outsider - how would you describe Fuenlabrada's playing style, what it means to be a fan of the club, and what it means to be a player of the club? The style of play is mainly based on absolute control of the game (We like to have the ball). We base our game a lot on our midfielders and wings. Being a fan of this club is the same as that of anyone who is fond of the club where they were born. That is, more than fanaticism, it is a feeling, something that you want as if it were a part of you. Being a player of Fuenlabrada is synonymous with feeling always loved and supported, even when things go wrong. Both when you play as a local and when you play as a visitor, the support makes you go out to the games very motivated and very sure of yourself. Describe the importance and significance of a game against a rival? What do you think would be the key differences between a Fuenlabrada fan and a fan of those clubs? The unconditional support of this hobby is key not only for the players, but for the club. And we are growing - more and more fans of C.F Fuenlabrada are joining. This past Sunday we sold out - with 3,200 people (Something unimaginable a few years ago). I can not tell you what sets us apart from other hobbies, which I can say is that we are a very friendly hobby with rival hobbies. We like to enjoy football in harmony. There was a time when Fuenlabrada were in the fourth tier of Spanish football. However, it has since "consolidated" itself in the Segunda B. How would you describe the last few seasons for Fuenlabrada fans? To this question I will respond with a name and two surnames ... Jonathan Praena Sánchez. Thanks to him, we climbed from the Tercera to the Segunda B as champions of our group. Thanks to him we got our best place in the Segunda B - 3rd place - and played for the first time the promotion playoffs and were also runners-up in the Federation Cup - and all that last season. And at the moment we occupy 2nd place in the league table of Group I of the Segunda B, and the objective is to ascend to La Liga 123. Undoubtedly, all these feats and goals would not be possible without the help of our president. Did you know that our president provides us free trips and tickets to support the team when we play outside our stadium? I insist, thanks to him we are living several wonderful years. The youth academy is something very important for any club and a satisfaction for any fan. Seeing a kid from the youth academy playing on the first team is a very nice thing. Juan Pedro Navarro is our Director of youth football, who comes from the youth teams of Rayo Vallecano. Without a doubt, his experience and his knowledge will help produce very good players for the first team. At the moment Miguel Ángel Atienza, is the latest youth player to debut for the first equipment, and the little that he has played, he has done quite well. I value the facilities and sacrifices that our president makes for us (tickets and free travel), and the desire to grow and become a professional team. What I don't like? Well, I don't have much to say, but I would like to make a suggestion to the club. I would like players to go to (as far as possible) to hospitals and encourage the most disadvantaged children, and colleges, to teach children the values of football and life. What is the most famous ultra group at Fuenlabrada? How would you describe them and their political affiliations? What is the feeling of fans of Fuenlabrada and of other clubs towards them? How would you characterize the Fuenlabrada board's support to them? I would describe them as a peña (Never as an ultra group, for me an ultra group is not the same as a peña of a team), very faithful, cheery, and sacrifice for C.F Fuenlabrada. They are very good people. Their political affiliations I do not know, but that should never be mixed with football or any other sport. The feeling made this peña by the local fans and rivals is that of cordiality. As I said before, I consider it a peña and not an ultra group, for the simple reason that the "Peña La 12 Sur", bases its behavior from respect, friendship towards all, and encourage every stadium with its chants and support for players. The support of the club for this peña I do not know, but I think they usually give the same facilities as any amateur. "La 12 Sur" is very important for the rest of the fans, as for the club. They support and encourage a lot. Yes, the Peña Fiebre Azul. How would you contrast the "Fuenlabrada fan experience" under the current board? The 2 peñas of Fuenlabrada are made up of people who know how to support the team without violence and with respect. I would call them as model fans - essential for the rest of the fans of C.F Fuenlabrada, as they involve us a lot with their songs. Is there something that the media doesn't (or maybe doesn't want to) talk about Fuenlabrada that you think is worth mentioning? With the exception of the "Diario AS" and the local media, no other media attaches importance to this division. This division, replete in its 4 groups of the Segunda B, is full of former teams and players of La Liga, a category full of talent and surrounded by people near and humble. My desire and dream is singular - that next season C.F Fuenlabrada ascend to La Liga 123. Yes - On October 26, a Real Madrid consisting of Cristiano Ronaldo, Sergio Ramos, Marcelo, Isco, and others will play the first leg of the Round of 16 of the Copa del Rey against Fuenlabrada - right here, at the Estadio Fernando Torres. The return will take place on November 29 at the Santiago Bernabéu.